On February 3rd 1945, I was born as the third child [of seven children] - six sons and one daughter-at [house number] 151, Seokmakri [village], Jinsan [area], Gumsan [county], in Choongnam province. Living in a mountain valley was tiring. Even though I wanted to farm, I did not have enough land, and even though I worked to the point my body was worn out, I could not fill my hungry stomach. It was a life of suffering. Suffering from hunger in the midst of dreadful poverty, I began my life of faith and started to believe in God, led by my eldest brother. Unlike others, I was very much in love with Jesus, so even while doing hard farm work, I would go on the top of the mountain behind my house, pray, and read again and again the only Bible we had in my house. 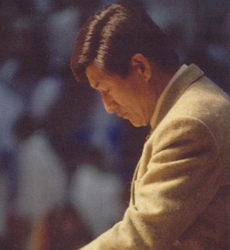 I began to realize about the Bible more deeply through prayer and through living by that kind of life of training. I came to realize that I should not stop at just realizing, but I needed to put those realizations into action. So [for instance], I brought home a mentally ill [homeless] man who could not discern anything, washed him, slept next to him, allowed him to sit together with my family [for meals], and ate with him. While putting [the Word] to practice, I came to realize deeply about Jesus' love. Immediately after I came back to Korea after my first tour of duty, I was sent back to Vietnam right away. 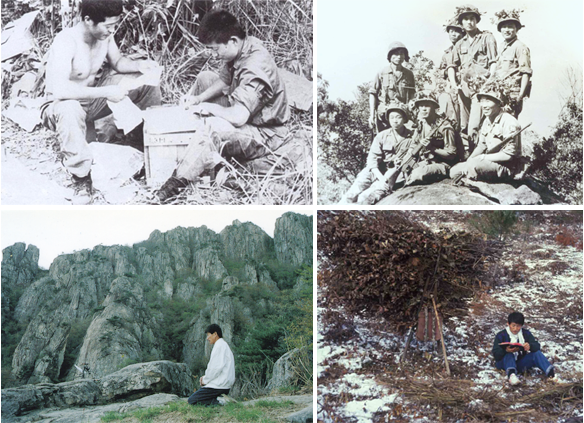 Until I finally came back to Korea the second time, I went through hundreds of ambush operations, mountain search operations, and numerous battles. There were dozens of dangerous moments in which I came very close to death. Through participating in the Vietnam War, I realized that we could not achieve peace with guns and knives, but we had to throw them away in order to achieve it. Jesus was always next to me and inspired me with realizations. He taught me about loving the enemy and said, "Although you are enemies to each other, you are not enemies to Me." Right after I came back from Vietnam, alive, I farmed with my parents, and went to Daedoon mountain, Darigol cave, and Gamram mountain, and other places in order to pray. Through prayer and a life of training, the Lord unraveled the deep secrets of the Bible in a new way. I'm all about actions, more than words. "I'm all about actions, more than words." Living up to my life motto, I preached the gospel by living according to the Word, and I set the fire of the gospel upon college campuses where [young] people were hungry for the new truth. To those who could not find the path of life and who misunderstood and distrusted God because they did not know the Bible correctly, I delivered the perfect words of life. The new fire of truth that clearly teaches us the truth about human beings, about faith, and about salvation is being spread not only throughout Korea, but also to over fifty nations around the world. Love and faith do not happen just with words alone. Living according to the Word is faith. The Bible is not just [made up of holy words, but it is a message of miracles in which are fulfilled for me even today, and it is the guide for our lives. The Lord's Word is being delivered even today, and I will continue to carry out the work of the Lord everyday.